It was a winding road for Blake Barnett, but the journey was well worth it. A five-star prospect in 2014, the junior signed with Alabama and redshirted. In 2016, he opened the campaign as the starter; however, lost the job to Jalen Hurts. Afterwards, he transferred to Arizona State and graduated with a degree in liberal studies. In the first two games of the season, Barnett has completed 69% of his passes for 507 yards and totaled eight touchdowns. The production will surely continue as the Bulls host Illinois and East Carolina the next two weeks before traveling to UMass. The dual-threat playmaker is available on far too many waiver wires and well worth an investment. On paper, the Rams hosting the Razorbacks looked like a terrible matchup for K.J. Carta-Samuels. Nonetheless, the Washington transfer rose to the occasion on Saturday: He completed 32 of 47 attempts for 389 yards and two touchdowns. With receivers Preston Williams and Olabisi Johnson, Carta-Samuels has one of the best receiving duos in the country. In three games, the Senior has averaged over 360 passing yards per game and tossed eight touchdowns. After a difficult matchup against Florida, the schedule becomes much easier as the Rams enter the Mountain West conference schedule. Last week, I listed Zac Thomas among the Waiver Wire Gemstones to acquire on rosters. His ownership increased from 1% but remains available across leagues. Thomas has produced over 30 points in back-to-back weeks, throwing for 565 yards, tossing five aerial strikes and rushing for two touchdowns. Do not allow another owner to acquire the Mountaineers’ rising star. Will Kendall Hinton be Wally Pipped? It sure looks like it. Hinton was suspended the first three games of the season for violating team rules. The suspension opened the door for freshman Sam Hartman to lead the club. He has embraced the opportunity and excelled. Rated the No. 12 pro-style passer by 247Sports, Hartman enrolled in school in January and won the job during training camp. He has recorded over 30 fantasy points in the first two games of his career and guided the Demon Deacons to consecutive victories, tossing four touchdowns and scrambling for another. Hartman ranks fourth among my targets among signal callers this week. New Coach Joe Moorhead made megastars of Chase Edmonds at Fordham and Saquon Barkley at Penn State. An elusive runner, Kylin Hill may be the perfect runner in Moorhead’s offense and has supplanted Aeris Williams, who ran for 1,000 yards in 2017, in the backfield. A blue-chip prospect in high school, the bruising ball carrier played all 13 games last year. On Saturday, Hill posted an unforgettable afternoon against Kansas State: He eclipsed 200 yards rushing and scored three times, including the game winner. An elusive and quick runner, Hill avoided tacklers and only once was tackled behind the line of scrimmage. Do whatever it takes to procure Hill on your roster this week. On Fantrax, Jafar Armstrong is listed at RB and WR, which makes him a very valuable player on CFF rosters. In high school, he set a Kansas state record with 45 career touchdowns and caught 172 passes. As a freshman last year, Armstrong spent the entire crusade on the scout team and did not play. At 6-foot-1 and 218 pounds, he is built like a receiver; nevertheless; was converted to running back before the start of the year. After two games, he leads the Irish in carries with 28 and rushing touchdowns with three. He also has latched onto five receptions for 72 yards. Notre Dame faces a difficult schedule this season, but the next two weeks look promising against Vanderbilt and Wake Forest. Position flexibility always makes a player an interesting roster addition. Regrettably, I did not advise picking up a running back in Hawaii’s Run-and-Shoot offense until now. I watched Holly against Colorado State and Navy, and he did not impress me. Against Rice, he earned another 17 carries and totaled 100 yards with two touchdowns. Over three games, the California native has 50 carries for 250 yards and scored three times. In the upcoming three weeks, the Rainbows play Army, Duquesne and San Jose: Hawaii should put up at least 35 points in each contest. Holly deserves a spot on CFF rosters this season. Rodney Anderson is one of my favorite players in college football. Unfortunately, he suffered a knee injury against UCLA and will miss the rest of the season. Coach Lincoln Riley stated “We’re heartbroken for him,” and CFF diehards are also distraught. But the season is not over, and the waiver wire provides solutions. I am targeting Sooners’ runner Trey Sermon, a four-star recruit by numerous scouting services, to replace Anderson. At 6-foot-0 and 224 pounds, the sophomore was named All-Big 12 Honorable Mention Offensive Freshman of the Year after rushing for 744 yards and scoring seven touchdowns last year. He has only carried the pigskin 16 times for 82 yards and scored once so far in 2018. In the Riley’s explosive scheme, Sermon is the next man up and will provide plenty of points the remainder of the year. 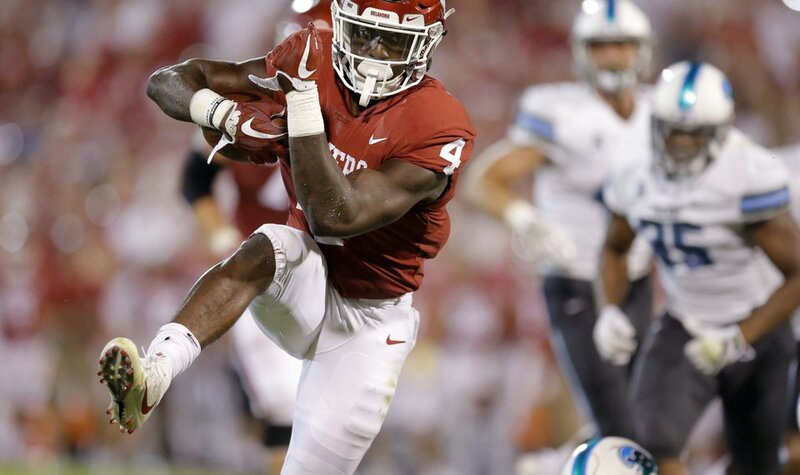 Time to hit the Waiver Wire in College Football: Who are you targeting at running back this week? With D’Eriq King slinging the football, the Cougars blowout of the Wildcats opened many eyes to the explosive Houston offense. Marques Stevenson missed the entire 2017 crusade due to injury. He is healthy now and playing well. In two games, the sophomore has snatched seven passes for 147 yards and two touchdowns. In the next three weeks, the Cougars travel to Texas Tech and host Texas Southern and Tulsa. Houston’s aerial assault will continue to soar, and Stevenson will provide fireworks for CFF owners who need assistance. In 2015, Javon Durante looked like a rising star at West Virginia as a freshman after scoring five touchdowns. He slumped the following campaign and reached the end zone only twice. The Mountaineers depth chart did not provide many opportunities for Durante. He transferred to Florida Atlantic and redshirted last season. Over the weekend, the junior playmaker scorched the Air Force secondary with 12 receptions for 174 yards and a touchdown. Coach Lane Kiffin pushes the ball downfield and will continue to put the peddle to the metal no matter the score. The Owls produced over 40 points per game last year and look primed to repeat the production. The schedule is very kind the remainder of the season, and Durante will become a viable weekly starter. During the summer, I waxed poetically about Mean Green receiver Michael Lawrence. Unfortunately, he has been one of my biggest disappointments in 2018. North Texas quarterback Mason Fine has completed over 70% of passes and tossed seven touchdowns. Rico Bussey, Jr. paces the club in receptions (17) and yards (237) and tied for the lead in touchdowns (3). At 6-foot-2 and 190 pounds, the junior is a mismatch for the majority of cornerbacks and a huge target for Fine. After a tough matchup on the road at Arkansas, North Texas opens the C-USA schedule, and Bussey will produce a buffet of points. Any home run hitter in the Cowboys’ passing game is worth targeting on rosters. In two games, Tylan Wallace has averaged over 15 yards a catch and scored twice on 14 receptions. A freshman, Wallace finished his high school career among the top 15 receivers in Texas history and ESPN ranked him as the No. 74 prospect in the nation. It is quickly becoming the year of the freshman receiver, and Wallace leads the team in every major receiving category. The Big 12 always provide a bonanza of fantasy viable wide outs, and Wallace might be the next in line for greatness.